While I loved it as a supplement to the core game, it truly shines as its own game. Sure, other faux-modern games have popped up over the years (with limited playability and concept), but something about this one stuck out. Originating from SGG/RGG’s unique style of archetypes and player builds, AA sort of evolved from that approach. On top of that, taking some lessons from D20 Modern and some successors, the game truly became its own unique entity. Enforcer type characters are better at holding their own in a non-fantastic setting, without worrying about stepping on the swashbuckler or gunslinger. Meanwhile, the psychic type characters generated by the Sensitive need not rely on casters to showcase their strange talents. The revised edition doesn’t really create a core setting of its own, but gives plenty of baselines and ideas for running your own campaigns. In fact, the rules state that they’re flexible enough to run an industrial age game through a modernized/near-future type game. In fact, it shouldn’t be too hard to make an urban fantasy game where modernity meets magical power. While on the forums themselves, some fans have pondering using the rule set to create a modernized Golarion. That said, supplements for a futuristic game have not been made available yet. In terms of mechanical bits, we have sections on new classes, feats, terminology, technology, super powers, and campaign inspiration. The classes are split into three somewhat generic heroic classes; Cogitator, Daredevil, Enforcer, Luminary, Sensitive and Tough. Each fit the mold of some respective D&D archetype, translated for a non magic centric modern game. The Cogitator is your investigator type character; standard fare for your CoC type games or good old fashioned mystery! The mechanics are built upon your ability to solve puzzles and decipher clues, as well as some great mechanics with heavy RP potential. All in all, an enjoyable class for the problem solver in all of us. The Daredevil is the dashing rogue for a more contemporary time! Here their maneuvers are based on fast paced action and life threatening stunts. The Daredevil is the Han Solo of the team. They know this and they love it! This class can be built up as a jack of all trades, a super spy, a thrill junkie or whatever thrills you. As the name implies, Enforcers are the soldiers, police and professional combatants. They best mirror the traditional warrior. What they lack in armor expertise, they make up for in martial techniques and gunslinger-esque pools of points to use on tactics. Luminaries are the charisma side of the bardic class, offering a sense of powerful presence and celebrity. These characters are movers and shakers in their own right; basking in privileges of wealth or at least massive social respect. In a similar regard, the Sensitive is more so a powerful leader or someone knowledgeable in the fine art of manipulation. Perhaps they’re even capable of strange psychic-like abilities! In fact, of all the classes to make the most out of ESP, this class is the most likely to do so. Last up, we have the Tough. This tough as nails substitute for the monk and barbarian can take a greater beating than the enforcer, but might not be as focused on mobility and tactics. For them, nothing’s as satisfying as dishing the damage right back! Beyond the classes, we’re presented with a variety of archetypes to truly customize your character. Anyone familiar with their previous archetype books should be familiar with how this is organized. Personally, my favorites are Device Wielder and Inventor, due to managing powers through all sorts of strange tech and super-science! This book adds in some interesting new rules and terminology. As the index suggests, we’re given a few new modules to play with. Most of these are light modifications to boost the atmosphere of the game. For example, battered gives you that element of injury in your games. After all, since this isn’t a world of magic and monsters, that bullet to the leg will do some nasty damage. Also, we the “potential menace” or some tips on creating the Blofield to our James Bond! The Low Magic options expand on battered, among other things. This allows for grittier play without modding the game too much. The feats modify your ability to dodge and fire away in combat, as well as a strange feat that seems better off as a spell (vehicle golem? What is that?) New rules for technology revamp the “Progress Levels” of D20 Modern, with a wide variety of cool gadgets for either a mundane game to James Bond-esque spy fun to something near future inspired. While the rules don’t completely spell out these types of games, they provide the frame work to modify its pulpy frame. On top of that, we have a means of super powers and extrasensory talents in the form of feats and class abilities, allowing a range of strange heroes to super powered heroes. While not super groundbreaking, it adds an interesting object for non-magical games or games with very low amount of powers. In terms of the strange, but not too altering; I’m interested in their simple, yet effective method of using monster base stats to generate vehicles. You simply apply a template and swap out unrelated aspects of the old creature with new properties to make a quick and easy vehicle. It’s so easy, yet so brilliant! However, the stats work better for some creatures compared to others… so, create this at your discretion. Last but not least, we’re given a look into making intrigue and mystery. While we get no mechanics here, we get some solid advice in not only running this book smoothly, but adding those types of tropes and motifs within the game. As I’ve seen other Pathfinder products that bring modernity into the gaming spotlight, I’m not 100% this one takes the top spot. Don’t get me wrong, it’s a great book. The presentation is great, the art is atmospheric, the mechanics are well made and are balanced enough to not have to rely on core PF content, the game plays quite well as its own entity. However, the feel of other games such as Modern Path and Modern Adventures seems more right with me. Why? I can’t quite say. To an extent, I wonder how much of an identity Anachronistic has. By itself, it’s a fine product, but the time between the AA line and the final book is great enough that other equally great products have sprung up. 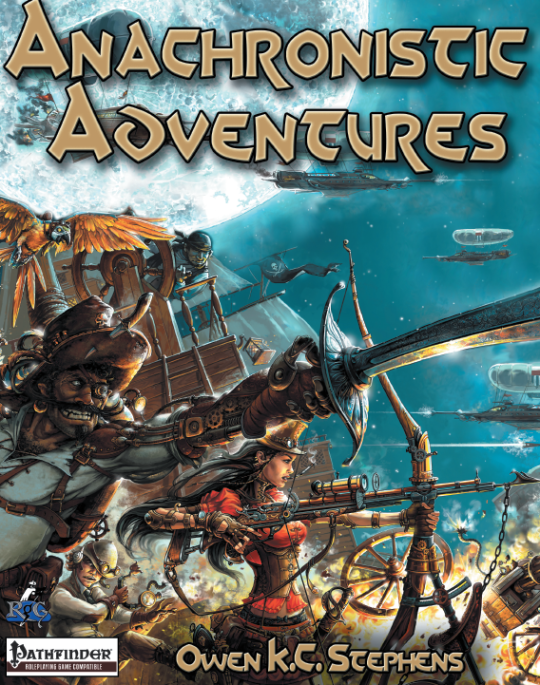 Overall, Anachronistic Adventures gets 8 pulp magazine cover out of 10! Not quite a crit, but it succeeds in blowing up the super secret soviet missile base!